The RORC Caribbean 600 is set to provide one of the biggest showdowns for years, as Mike Slade's Farr 100, ICAP Leopard, takes on George David's Juan-K designed, Rambler 100 (formerly Speedboat). This will be the first time these two heavyweights of the sailing world will have raced each other. The battleground will be the wild surf and constant trade winds of the Caribbean. The two Maxis are likely to be absolutely launched, both day and night, hurtling around a course designed to thrill. Surfing at speeds in excess of 25 knots in a titanic battle to cross the finish line. The winner of this gunfight in Antigua will certainly have bragging rights and points on the board for the inaugural Atlantic Ocean Racing Series. Mike Slade, owner of ICAP Leopard, sees the RORC Caribbean 600, as the start of a very exciting campaign: "Competition will be fierce," predicted Mike Slade. "It is highly likely that different boats will have the rub of the conditions throughout. Rambler 100 is a very quick boat but like ICAP Leopard, she has a lot of beam, so may be sticky in the light and possibly a bit more fragile than us in heavier air. To win any yacht race you have to complete the course and I have no doubt that the RORC Caribbean 600 will provide a fantastic curtain raiser for the Atlantic Ocean Racing Series." Slade continues: "I have to take my hat off to the four clubs that have got together and made this series happen; The New York Yacht Club, The Royal Yacht Squadron, Royal Ocean Racing Club and the Storm Trysail Club. Also George David, who has been a real driving force and should be applauded for his efforts. We really are looking forward to taking them on and flying the flag for Great Britain." George David was understandably delighted with his new boat and taking on ICAP Leopard, in the RORC Caribbean 600: "On Rambler 100 we're all looking forward to the boat's first trip around the RORC Caribbean 600 track. There will be enviable competition and an enviable record to go after. On the other hand, this will be Rambler 100's second race start under my control, the first being the Pineapple Cup from Miami to Montego Bay and we'll be racing against boats including Leopard that have been campaigning and optimising for several years. The race should be an interesting test for us all around and there will certainly be enough corners to test all crews. Congratulations to the RORC for the perseverance and skill to put this outstanding distance race together." 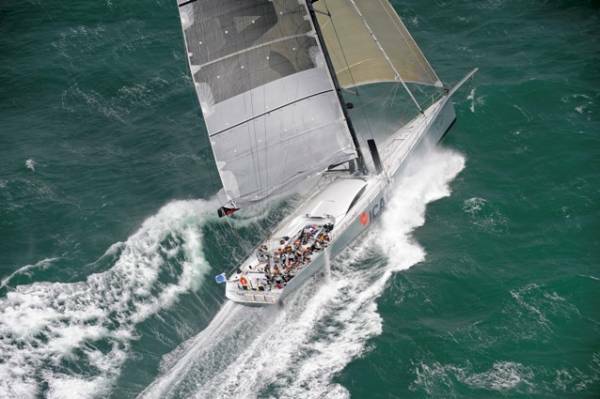 The RORC Caribbean 600 and the Pineapple Cup (Miami to Montego Bay) are the first events in the 2011 Atlantic Ocean Racing Series (AORS). This series is in its inaugural year and includes seven of the great blue water races in the world. After these two races in the Caribbean, the series moves up the U.S. East Coast with the Annapolis to Newport Race. Right after comes the Transatlantic Race 2011 from Newport, Rhode Island to the Lizard, just west of Plymouth, England. The European races then kick in with the hugely popular Rolex Fastnet Race, a new Biscay Race organised by the Royal Yacht Squadron from Cowes to Sanxenxo on the northwest corner of Spain and on to Malta for the Rolex Middle Sea Race organised by the Royal Malta Yacht Club. Participation in three races, one of which must be the Transatlantic race, are required to qualify for the AORS and IRC rating will be used throughout. The RORC Caribbean 600 course record for mono-hulls is 44 hours 5 minutes 14 seconds, set by ICAP Leopard in 2009. On the 21st of February 2011, Rambler 100 and ICAP Leopard will cross the start line of the RORC Caribbean 600, off English Harbour, Antigua. It is a mouth-watering prospect; two of the world's most impressive racing yachts locking horns over 600 miles of high-speed action, in a fight to the finish.